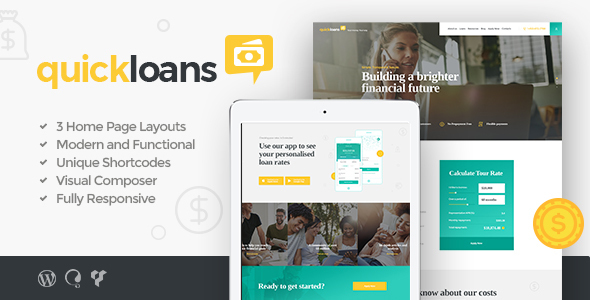 QuickLoans is a WordPress theme designed for loan companies, quick loan firms, for companies who provide tax assistance to corporate and individual clients, for financial and legal companies, and individual tax/finance advisers. QuickLoans is 100% responsive and fully editable. Whatever you feel like changing â€“ hereâ€™s an easy-to-use admin panel to your access, with its handy Customizer. Want to get the demo just like ours? â€“ simply use one-click demo installation option, and there you go! Any issue occurred â€“ youâ€™ll be helped within hours.